Book your accommodation to guarantee its reservation and availability. Accepted payments are thru credit cards and paypal. A booking confirmation will be sent to your email within 24 hours after payment. In case of cancellation, ten percent (10%) of the full period charge is non-refundable and will serve as transaction service fee. Any cancellation received within seven (7) days prior to arrival will incur the first one (1) night charge. Any cancellation received within three (3) days prior to arrival or no-show will incur the full period charge. Bookings must be cancelled thru sending a cancellation email indicating your Booking Confirmation Reference Number to bemyguest@tr3ats.com or by calling +63.32.4228881. Children stay for free if using existing bedding maximum of 2 children per private room. Guests over 10 years old are considered as adults. Extra person is charged at Php 350.00 per person. Extra bedding is not allowed on all accommodations. This is a private room with 1 double bed that can accommodate up to 2 persons. Ensuite Bathroom with Hot and Cold Shower, Airconditioned, LCD Cable TV, Free Wifi, Free Toiletries. Rates are on a per room basis. 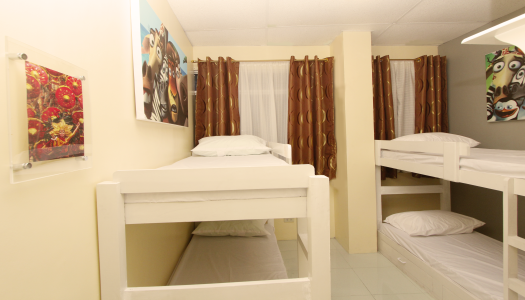 This is a private room with 2 bunk beds that can accommodate up to 4 persons. 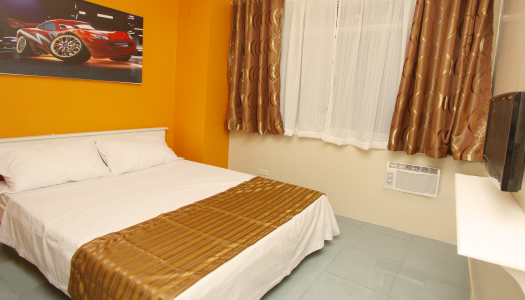 Ensuite Bathroom with Hot and Cold Shower, Airconditioned, LCD Cable TV, Free Wifi, Free Toiletries. This is a common room that can accommodate up to 6-8 persons with common Bathroom, Hot & Cold Shower, Airconditioned, Free Wifi, Free Toiletries. Rates are on a per person and per bed basis.